It was nice to see some cloud cover early on but as the sun broke through and with flags hanging limply, we had our usual scorcher. 38 players in the pairs betterball, but due to many assuming it was stableford and some picking up, we changed it to a betterball stableford. It is a popular team format where you have a partner to rely on. We had our usual free draw for the non-winners and a change from the usual caps and towels. We now have a stock of pitchmark repairers and packs of 3 srixon balls, both with the golf society logo on. Some fantastic scores in with an amazing 55pts winning it by a country mile! Fran and Lee Hobson will need to look at the handicap sheet next week! The Viking cup (Norway v UK) is the next major event on Tuesday October 25th. Let me know if you want to play and also let Cath know if you are coming to the after match celebrations at Trevis. It is so popular that places may be limited this year so make sure you get your name down early. The Benidorm trip is now closed. We have a maneagable 12 people going for a night out, game of golf and market trip. The fixture list/diary for 2012 are now here and can be collected from Phil Tann. They will be free to members so collect yours on your next visit. Thanks to Dave Lloyd for doing a fantastic job organising the production of them. Latest news hot off the press is that the sports bar ( correct name the Condado Club) will be opening on Saturday October 15th, so Polaris will no longer have a monopoly with the Clover bar. The society will support this new venture and we wish Paul and his team all the best. I am sure he will give us brits the service and choice which we have missed over the last 3 years. Above are a few of the 95 photos taken by Brian (SCottees customer) – thanks very much Brian. With the course closed all week for maintenance, we have had to seek pastures new for society golfers this week. 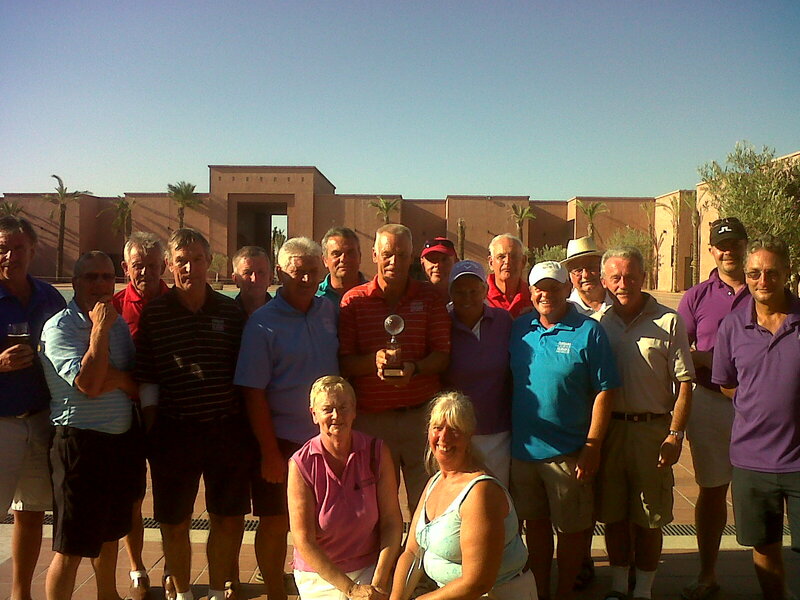 On Monday there were only 4 players at Hacienda del Alamo and Wednesday saw 16 golfers at Saurines de la Torre. Saurines was a disappointment mainly because of the lack of facilities. The first match finished at 3pm and in desperate need of liquid refreshment we found the supermarket had closed at 2.45pm. There is a little bar next to the golf shop which has never opened, and the drinks machine inside was not stocked up. Not surprising then that Olagolf are struggling to attract customers. 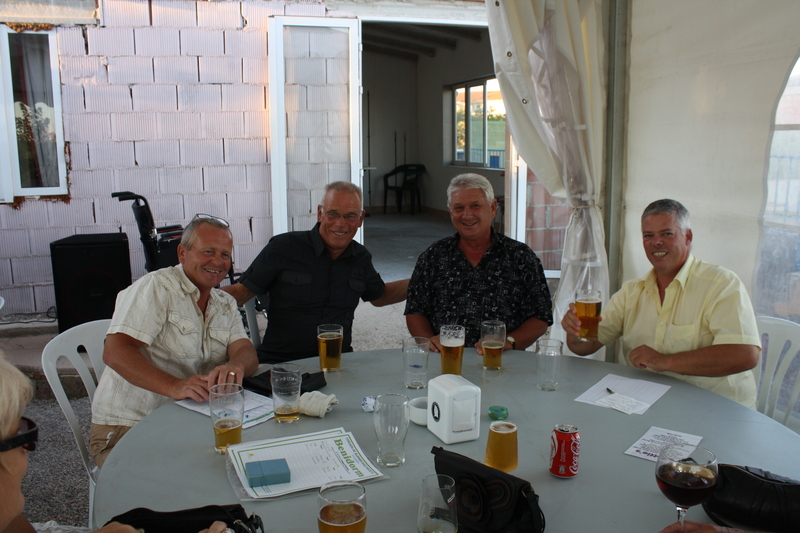 Friday saw us go to the other Olagolf course at Mar Menor. What a contrast with excellent facilities which was a relief after 5 hours in the relentless sunshine with little breeze to be had. Brian Mills recorded his second win in 3 days with 36pts each time. A super performance off his handicap of 4. 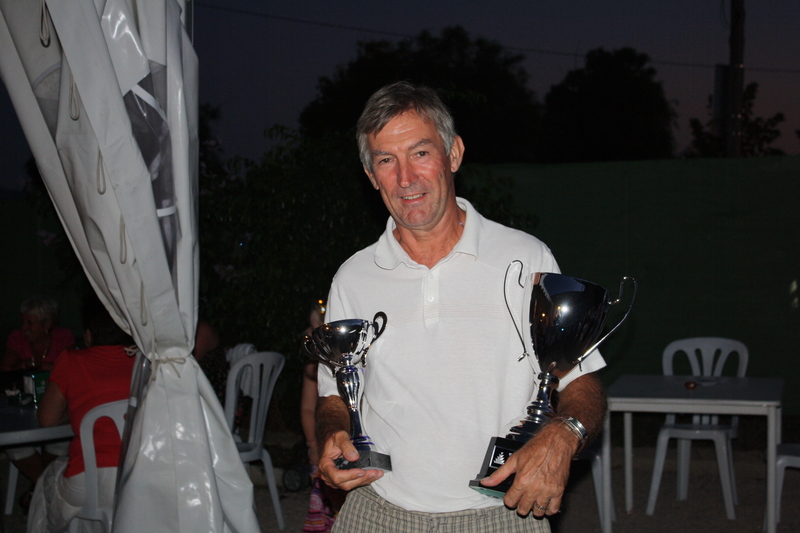 2nd place went to Barry Greenall with 35pts and in 3rd place was Richard Talbot with 31pts (with a better back nine). Next Friday is a pairs betterball competition. 36 players played in the 2 person scramble and some great scores were returned. 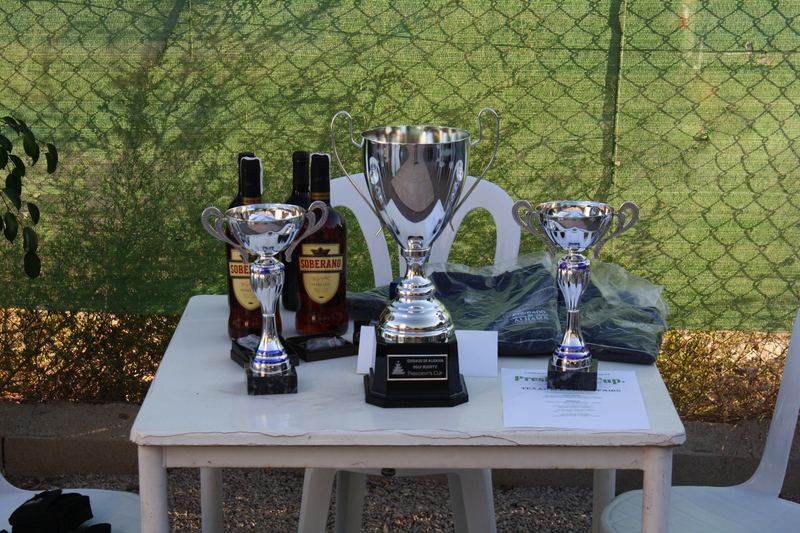 Entry was free and the prizes were donated by the society. At short notice we had to move the presentation & party to Scottees bar. 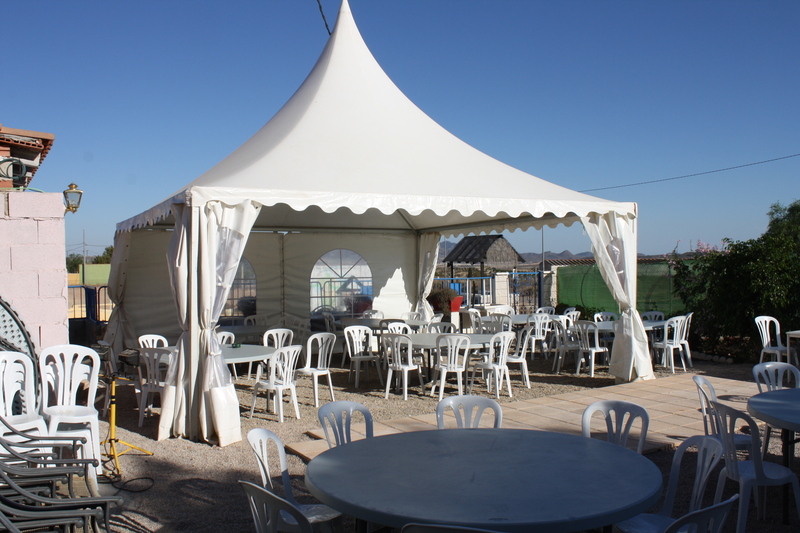 Andy and his team provided a marquee out back with plenty of seating and karaoke with Fillipe. Everyone had a great time. Next week our course is closed for maintenance, but I have put lists on the board for awaydays Monday, Wednesday and Friday. Last spring we played against Mar Menor G.S. at Saurines and were well beaten. In the return match this week we challenged them to a rematch at Condado. Home advantage proved to be crucial as we won the Olagolf crystal ball trophy narrowly by 5 and a half points to 4 and a half. The Smiths – Kevin and David (no relation) were our stars winning their match by 8 and 6. The match was 4 ball matchplay, and although the score sounds close, there were 10 matches but Condado had enough points in the bag after 7 of them, with Mar Menor making a late rally winning the last 3 matches. President’s day is Friday with 36 players in the pairs scramble competition. However, bad news. The party in Naranjos 4 has been cancelled due to one complaint from a resident who didn’t want people from other gardens on his (or her) garden. We invited everyone on site to foster community spirit, but despite helpful talks with Mileniun we were unable to resolve it. Scottees were bringing us a mobile bar, Marquee, food, tables and chairs and a DJ was also booked. Now we are going to Scottees for the presentation with a bus needing to be hired at a cost of 200 euros for the 15 minute journey. Thanks very much! As the course is closed next week I have booked times at Hacienda del Alamo for Monday and Saurines de la Torre on Wednesday. Still looking at options for Friday. Will report on Presidents day on Saturday. The residents amongst the 52 players welcomed the downpour which accompanied this stableford competition. The later starters abandoned the golf about the half way stage after suffering a severe soaking! However there were again some really good scores. 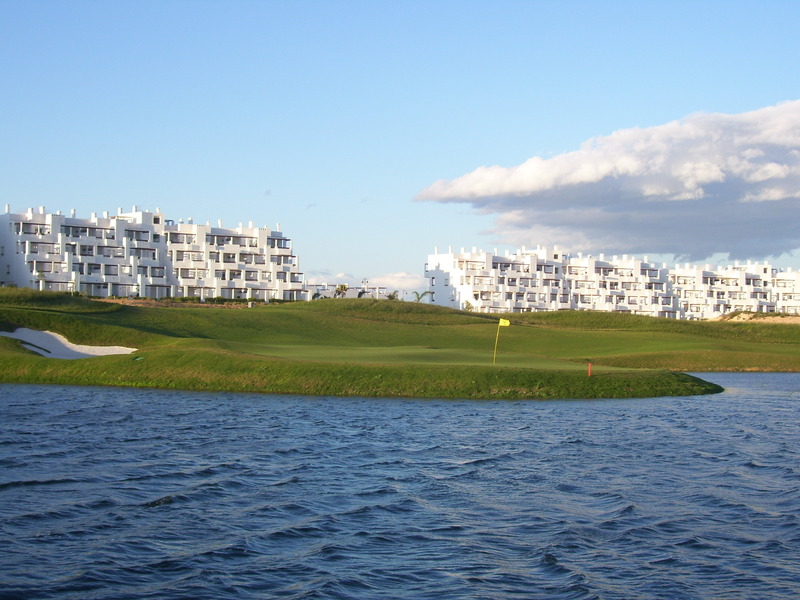 Next Wednesday is the biennial challenge match against Mar Menor played at Condado. Mar Menor won the last match at Saurines so we are out for revenge! Friday sees our 1st President’s Cup (Graham White this year). This will be a pairs texas scamble with players seperated into high and low handicaps and drawn out of two pots. Only existing members can win the main trophy, but newcomers will be allowed to take part but for a seperate prize, Existing members will receive free entry into the competition. This will be followed by the presentation and party in Graham’s garden (naranjos 4). Eveyone on site is invited golfers or not. Scottees are bringing a mobile bar and marquee with chairs for the customers. They will supply drinks and food so you don’t need to bring anything with you. We will have a DJ and a karaoke starting at 7pm and finishing at midnight. Please come along and join in. 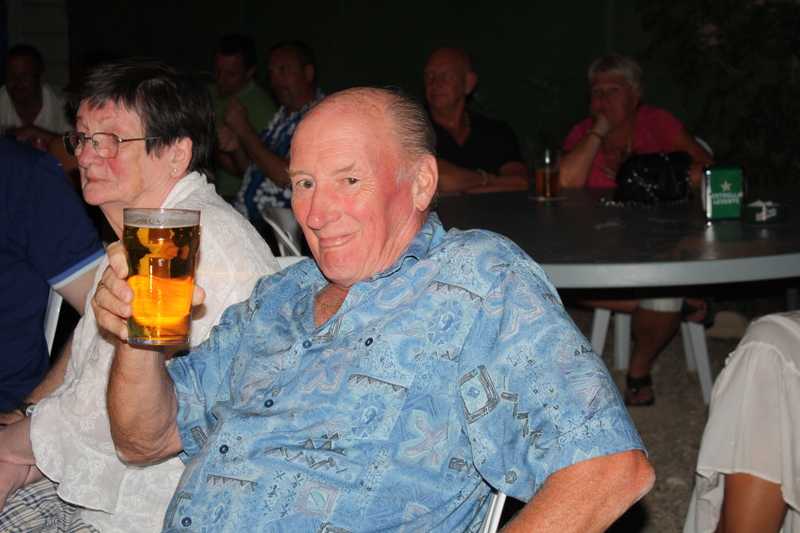 We are planning an away day to Benidorm on Tuesday November 8th with overnight stay in a hotel yet to be chosen. Golfers will play at the Villatania course in Benidorm (price seems to be about 60 euros) whilst others can spend a few hours in the market or shops. Hotels usually charge about 60 euros for a double or twin with breakfast and evening meal included. Anyone interested contact myself or Cath. Time for another rule explanation relating specifically to Condado. We have 5 lakes in play and they are all lateral water hazards (all with red posts denoting this). The margin is an imaginary line between the posts. 2) a point on the opposite margin of the hazard equidistant from the hole. The 2nd option is not really feasible at Condado on any of the lakes. You can always replay your shot under a one stroke penalty from the point you played your last shot ( e.g from the teeing ground on hole 10). Another interesting point was uncovered in this research…….. regarding the unplayable rough which golfers have struggled with all summer. It seems we are allowed to make a local rule defining such areas under the lateral water hazard rules. Some desert courses are lined by areas of rocks or boulders and they do make a local rule for these areas. Therefore we could decide that any area of long grass can be treated as a lateral water hazard and relief taken as above. Initially I did not want to give relief from it as I thought it was unfair on good golfers who did not go in it and I did not want to introduce our own rules of golf. It seems though that this is possible under the R & A rules so we will consider it for next year when the rough starts to grow again.